The Canadian automotive industry is the eighth largest in the world with positive trade balance, according to the information provided by the Government of Canada. According to other sources, it is the ninth largest automaker. It is the biggest contributor to manufacturing Gross Domestic Product providing over half a million jobs. The history of car making in Canada dates back to 1904. Within this year, Gordon McGregor and Wallace Campbell manufactured over 100 Ford Model Cs at their factory located in Walkerville, Ontario. From 1918 to 1923, the country was the world’s second largest automaker. The industry includes assembly plants of foreign automakers, as well as plants producing automotive parts and systems. 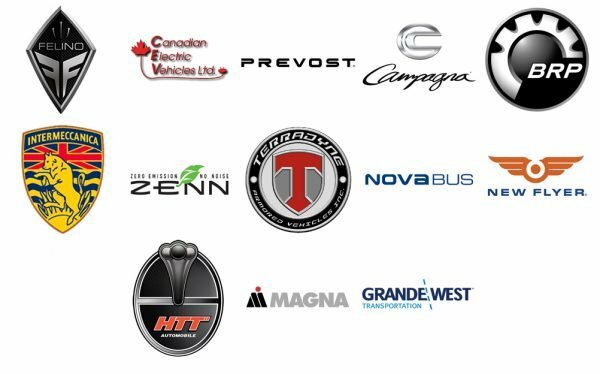 The number of Canadian car brands exceeds fifteen. The company is proud of its history and tradition and accentuates this fact by sticking to its Prancing Bull logo. Its retro look is emphasized by the shield shape as well as the somewhat pale shades of red, blue, and yellow. The automaker, which used to be a part of Bombardier Inc., was sold to a group of investors in 2003. The BRP emblem is built around a stylized depiction of a tire in grey and white against the black background. All these, together with the short name of the company, are placed inside the grey circle frame. The emblem of the Quebec-based private corporation would be very simple and minimalistic if it was used on its own, without the wordmark. The emblem is an oval with a concave part on the right. The wordmark is given below in a handwriting script, which looks very beautiful in itself, yet somehow contradicts the futuristic emblem. The subsidiary of Volvo Buses specializes in manufacturing touring coaches and bus shells. The highlight of the company wordmark is the custom sans serif all-cap typeface. The unusual shape of the letters “P”, “R”, “E”, and “S” emphasizes the concepts of speed and motion. The Privately owned automaker is most known for its fully electric Might-E Truck. In addition to the name of the company with the highlighted initials, there is the depiction of a maple leaf with an electric plug. This is a perfect embodiment of the company’s core product. The Conquest Vehicles logo comprises the capital letter “C” in a circle frame. Around it, there are two ovals: one full, the other one without the upper part. The emblem itself is given in the metallic color, while the background is black. The Montreal-based auto manufacturer established in 2009 focuses in racing cars and supercars. The wordmark seen on the cars is given in a beautiful fancy script. The most prominent letter is the initial. The badge itself is a shield, the shape of which is close to the rhombus. It is placed on the front grille of the cars. The history of Foremost started in the middle of the previous century with a line of tracked vehicles for heavy terrain applications. In 2013, a group of nine companies came together under the name of Foremost. Today, the manufacturer has two main divisions, one dealing with energy equipment, the other dealing with mobile equipment. The logo the company uses now is the original Foremost wordmark. It features capital letters given in a sans serif all cap italicized typeface, with a unique “F”. The British Columbia-based company Grande West Transportation Group was established in 2008. It focuses on manufacturing buses. Its most known product is the community shuttle bus the Vicinity. The wordmark features the name of the company in two lines. The words “Grande” and “West” in a dark shade of blue are separated by an angled line. The word “Transportation” in light blue is placed below. The Quebec-based company is known as the manufacturer of the HTT Pléthore, Canada’s first supercar. HTT Automobile has been inactive recently. The logo seen on the HTT Pléthore combines a human torso and a sword within a single emblem. INKAS is a group of companies specializing in security and protection services. Its main division, Armored Vehicle Manufacturing, has introduced a number of vehicles, from executive SUVs and luxury sedans to cash-in-transit vehicles. The concepts of security and protection are embodied in the logo: this is why the depiction of a sword appeared here. Also, the wings are used as the symbol of speed. The global automotive supplier is based in Aurora, Ontario. In 2014, it was named the main automobile parts manufacturer in North America. In addition to the wordmark in a bold sans serif type, the company has an emblem depicting a stylized “M” with a small red circle above it. The Winnipeg-based company manufactures heavy-duty transit buses and motorcoaches. It also deals with the distribution of aftermarket parts. The New Flyer logo uses one of the most popular symbols of speed – the wings. Between the two orange wings, each comprising three “feathers”, an orange dot is placed. The wordmark in dark blue features a clean sans serif typeface. The bus manufacturer was established in 1993. Today, it is the property of Volvo Buses. The wordmark combines capital and lowercase letters, yet the lowercase letters have the same size as the capitals, so the combination does not look odd. Terradyne manufactures armored cars. The Terradyne Armored Vehicles Gurkha range includes three types of models, LAPV, MPV, and RPV. The simple roundel badge is a perfect embodiment of the company’s core values. The name of the company stands for “Zero Emissions No Noise”. The eco-friendliness of the manufacturer is emphasized in its logo. Not only does it decipher the ZENN acronym, but it also contains the depiction of a green leaf, one of the most popular symbols of all things natural.